Pellet Smoker Tube are light weight, durable and portable smoke generators, that produce great quality smoke for cold and hot smoking. They are versatile enough to be used in just about any smoker or a grill. They are designed to burn pellets and supplement smoke at higher temps, in pellet grills/smokers. This is where most pellet grills/smokers do not produce much smoke. The amnts adds additional smoke at cooking temps, regardless if your pellet grill/smoker is burning pellets or not. The tube smokers perform very well in pellet grills, gas grills and gas smokers. Their unique design takes up very little space on your grates. Stainless Steel Perforated Mesh Smoker Tube Unlock tantalizing and unforgettable smoked flavors in your meat, fish, vegetable, cheeses, nuts and more for bold new tastes. 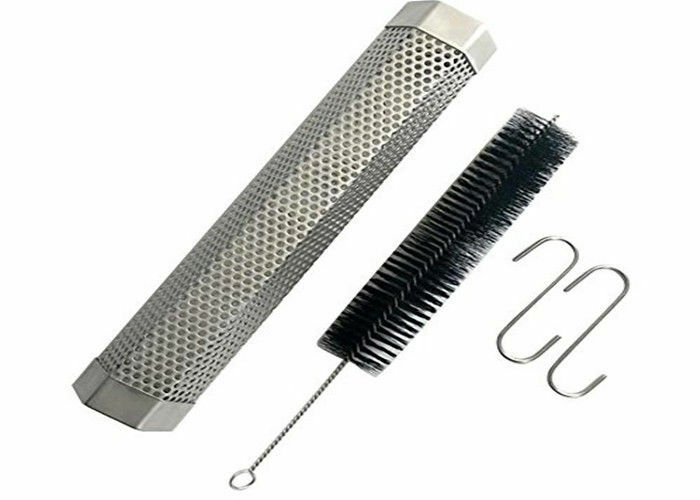 > Fantastic for cold smoking, grilling and more- Used to cold smoke meat, fish, cheese, nut up to 5 hours in an electric smoker. Add a wonderful touch of smoke to things hotter and faster. > Built to last - 100% stainless steel material, portable 12'' x 2'', light weight, thick and durable. Works with with all kinds of grills like gas burner, charcoal, electric and portable grills. > Prevent from rolling around the grill grates - Amazing Triangle shaped tube-smoker helps this stay in place during smoking. > Easy to use & clean - Fill with full of pellets, light the pellets with a propane torch about 1min, burn them for 10min and get 4~5 hours of smoke. Clean up with a bottle brush for the inside and simple dish rag for outside. ---- Lightweight, portable, wasy to use or clean and durable - our product is nothing but awesome. Get them while they are hot and you will not be disappointed. ---- Delicoius smoke flavor - unlocked tantalizing and unforgettable smoked flavors in your meat, fish, vegetables, cheese, nuts and more for bold new tastes. ----- Great gift - a perfect housewarming gift for your family and friends moving to a new house, or that favourite pitmaster in your family. ----- The only thing better than afood hot off the grill is when it is been smoked to perfection. - Whether you are a grill master or just love breaking out the smoker during the summer, you want to creat flavors that make poeple’s eyes widen and their mouths drop. That is why you need the pallet smoker tube, a simple and easy way to add bold smoked flavors to any meal with ease. Outside diameter: 1" to 12"